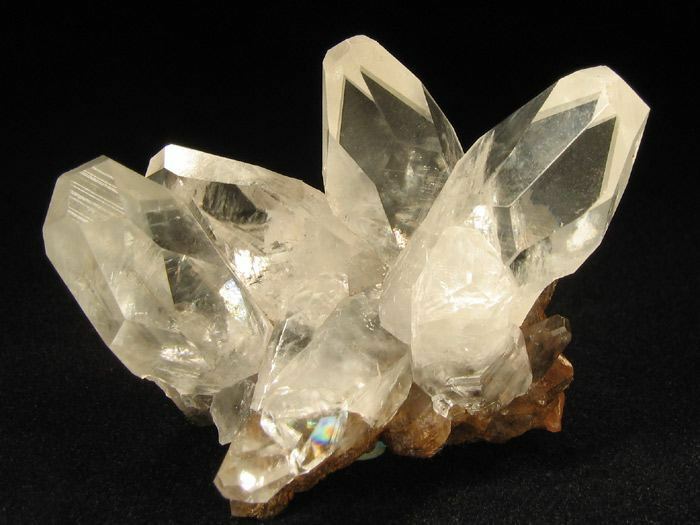 Calcite Group: Mineral information, data and localities. After the principal species in the group. Calcite group structures are taken by nitrates and carbonates of relatively small cations, including Li, Na, Mg, Ca, Fe2+, Zn, Co2+, and Cd. 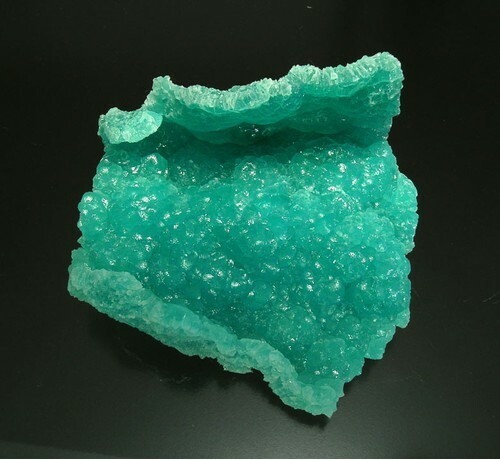 The structure of calcite and its related species is ionic and resembles that of NaCl, the place of the spherical Cl ions being taken by planar (CO3)2- or (NO3)1- groups. These groups are arranged in parallel position in the crystal with their threefold symmetry axes oriented along . This arrangement leads to the strong birefringence of calcite-group minerals. An essential component of rock names highlighted in red, an accessory component in rock names highlighted in green. Bragg W.L. (1914) Proceedings of the Royal Society, London: 89A: 468. Palache, C., Berman, H., & Frondel, C. (1951), The System of Mineralogy of James Dwight Dana and Edward Salisbury Dana, Yale University 1837-1892, Volume II: Halides, Nitrates, Borates, Carbonates, Sulfates, Phosphates, Arsenates, Tungstates, Molybdates, Etc. John Wiley and Sons, Inc., New York, 7th edition, revised and enlarged: 141-142. Showing 160 significant localities out of 43,476 recorded on mindat.org. [Calcite] Raúl Tauber Larry´s collection. Ruiz, D. R., Ávila, J.C. & Lazarte, J.E. : Las vetas de calcita de Farrallón Blanco, Sierra de la Ramada, Tucumán. Facultad de Ciencias Naturales e Instituo Miguel Lillo. Miguel Lillo 205. 4000. Tucumán, Argentina. doraruiz10@hotmail.com2, CONICET. [Calcite var: Manganoan Calcite] Ramdohr, P. (1950): Contributions to Mineralogy and Petrology 2(4), 291-333. [Gaspéite] Am.Min. : 78: 819-821.; Nickel E H, Robinson B W, Mumme W G (1993) Widgiemoolthalite: the new Ni analogue of hydromagnesite from Western Australia. American Mineralogist 78, 819-821; Clissold, M. E. (2007) Aspects of the Supergene Geochemistry of Copper, Nickel and Bismuth. PhD Thesis University of Sydney, Australia 162pp. [Siderite] Palache, C., Berman, H., & Frondel, C. (1951), The System of Mineralogy of James Dwight Dana and Edward Salisbury Dana, Yale University 1837-1892, Volume II: 169; collection Landesmuseum Joanneum - Graz; Pohl, W., and Belocky, R. (1999): Mineralium Deposita 34, 614-629. [Magnesite] Hubmann, B. & Weber, L. (2010): Rohstoffe und Riffe im Grazer Paläozoikum. Journal of Alpine Geology 53, 159-180. ; Kolitsch, U. & Gröbner, J. (2016): Cobaltit, Delafossit und Monazit-(Ce) vom Magnesitbergbau Breitenau am Hochlantsch. Der Steirische Mineralog 31, 50-51. [Calcite] Les mineraux de Belgique and Geonieuws nr.2-1983; Blondieau, M., Hatert, F. et Defoy, M. (2012) - Minéralogie de la carrière de Beez, Province de Namur (Belgique). Le Règne Minéral, 104, 5-26. [Magnesite] Palache, C., Berman, H., & Frondel, C. (1951), The System of Mineralogy of James Dwight Dana and Edward Salisbury Dana, Yale University 1837-1892, Volume II: 164; Mineralogical Record: 9: 200-202; Mineralogical Record: 10: 55; Mineralogical Record: 23: 276; Mineralogical Record: 25: 212, 215.; Mineralogical Record: 20: 394. [Calcite] Bonev, I. K., Garcia-Ruiz, J. M., Atanassova, R., Otalora, F., & Petrussenko, S. (2005). 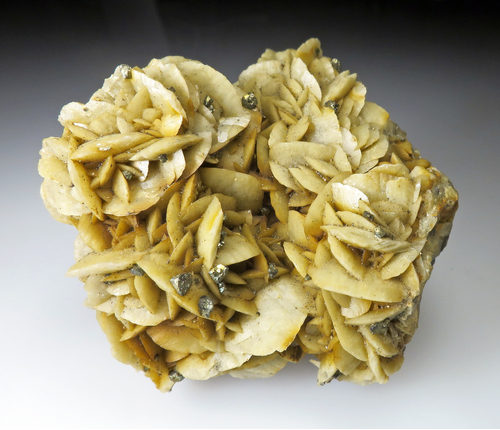 Genesis of filamentary pyrite associated with calcite crystals. European journal of mineralogy, 17(6), 905-913. [Gaspéite] KOHLS, D.W. & RODDA, J.L. (1966): Gaspéite, (Ni,Mg,Fe)(CO3), a new carbonate from the Gaspé Peninsula, Quebec. American Mineralogist 51, 677-684. [Rhodochrosite] Rob Lavinsky; Lees, B., S. Behling, D. Misantoni, V. Luders, R. Romer, P. L. Sanchez, P. Cory (2011) The Wutong Mine, Guangxi Zhuang Autonomous Region, China. Mineralogical Record 42:521-544. [Siderite] Belot, Victor R. (1978) Guide des minéraux, coquillages et fossiles: où les trouver en France, comment les reconnaître et les collectionner (Guides Horay). Pierre Horay (Ed. ), 224 pp. ; Moore, T.P. (1989) Notes From Europe (Column) Bad Ems, Ste.-Marie and Rheinland-Pfalz Shows. Mineralogical Record, 20(6), 483-486. [Calcite] Personnaly collected by M. Diot. [Calcite] Belot, Victor R. (1978) Guide des minéraux, coquillages et fossiles: où les trouver en France, comment les reconnaître et les collectionner (Guides Horay). Pierre Horay (Ed. ), 224 pp. [Calcite] O’Reilly, C., Feely, M., McArdle, P., Mc Dermot, C. Geoghegan, M. & Keary, R. (1997). Mineral localities in the Galway Bay Area. Geol. Surv. Ireland. Special Report Series. RS/97/1(Mineral Resources) ISSN0790-0279, 70p. & 1:150,000 Geological and Mineral Localities Map of the Galway Bay Area. [Calcite] S. Moreton, unpublished observation. [Calcite] Ref. : Battilocchi G., (2005)- La calcite di Rio Capanne, Val di Taro, Appennino Parmense - Mineralparma, n.1, IV year, 12-14. [Otavite] Orlandi, P. & Campostrini, I. (2005): Zibaldone. Aggiornamenti di mineralogia italiana 2004. Rivista Mineralogica Italiana, 3/2005, 184-191. [Smithsonite] Wilson, W.E. (2011) The Refugio mine, Municipio de Choix, Sinaloa, Mexico: The Mineralogical Record: 42(5): 453-461. [Magnesite] Cairncross, B. (2004) Field Guide To Rocks & Minerals Of Southern Africa. 138. [Calcite] Econ Geol (1985) 80:416-478; Imai, H. (1999): Mineralizations of base metal deposits of acid-sulfate type coexisting with adularia-sericite type. Resource Geology 49, 147-156. [Rhodochrosite] Palache, C., Berman, H., & Frondel, C. (1951), The System of Mineralogy of James Dwight Dana and Edward Salisbury Dana, Yale University 1837-1892, Volume II: 174; Mineralogical Record (1997): 28(4). [Siderite] American Mineralogist, Volume 67, pages 854-860, l982; Bussink, R. W. (1984). Geochemistry of the Panasqueira tungsten-tin deposit, Portugal. Geologica Ultraiectina, 33, 1-170. [Rhodochrosite] Palache, C., Berman, H., & Frondel, C. (1951), The System of Mineralogy of James Dwight Dana and Edward Salisbury Dana, Yale University 1837-1892, Volume II: 174; Zeitschrift für Kristallographie (1981): 156: 233.; Grancea, L., Bailly, L., Leroy, J., Banks, D., Marcoux, E., Milési, J., ... & Fabre, C. (2002). Fluid evolution in the Baia Mare epithermal gold/polymetallic district, Inner Carpathians, Romania. Mineralium Deposita, 37(6-7), 630-647.; Hîrtopanu, P., Andersen, J., Hârtopanu, I., & Udubaşa, S. Ilvaite From The Cavnic Deposit, Romania. pp62-65; Plotinskaya, O. Y., Damian, F., Prokofiev, V. Y., Kovalenker, V. A., & Damian, G. (2009). Tellurides occurrences in the Baia Mare region, Romania. Carpathian Journal of Earth and Environmental Sciences, 4(2), 89-100. [Calcite] Bálintová, T. et al., 2006: Mineralogické štúdium fantómových kalcitov z Gemerskej Vsi. Miner. Slov., 38, 2, 124-130. [Rhodochrosite] Wilson and Dunn (1978) Famous Mineral Localities: The Kalahari manganese field. Min Rec 22:137-153; Caircross, Beukes, Gutzmer (1997) The manganese adventure. ; Von Bezing, K. L. et al. (1991) - The Kalahari (Afrique du Sud) manganese field : an update, Min.Rec. : 22 (3), 279-302; Rocks & Min. : 61:7. [Calcite] Calvo, Miguel. (2012). Minerales y Minas de España. Vol. V. Carbonatos y Nitratos. Boratos. Escuela Técnica Superior de Ingenieros de Minas de Madrid. Fundación Gómez Pardo. 711 págs. [Calcite] Calvo, G. y Calvo, M. (2006). Fluorite from Spain. Every color under the Sun. En: Fluorite. The Collector's Choice. Lithographie LLC. Connecticut, USA. 38-42. [Calcite] Calvo, M. (1996) Mineralogía, La Unión. Bocamina, 2, 14-35. [Calcite] Collected by many collectors over many years . [Calcite] Mathew Maneotis data. Colorado School of Mines. [Rhodochrosite] Jensen,M. (2004), A mystery mineral occurrence at the Sweet Home mine, Park Co., CO, Min. News: 20(5): 1-2; Rocks & Min. :61:7,9 & 75:305. [Calcite] Januzzi, Ronald E. (1959): The Minerals of Western Connecticut and Southeastern New York. The Mineralogical Press, Danbury, Connecticut. ; Januzzi, Ronald E. (1994), Mineral Data Book - Western Connecticut and Environs. The Mineralogical Press, Danbury, Connecticut. [Calcite] Bartsch, Rudolf C. B. (1940): New England Notes. Rocks & Minerals, vol. 15, no. 8, p. 274. [Calcite] Zodac, Peter. (1959), Minerals at Thomaston Dam, Connecticut; Rocks & Minerals: 34: 3.; Myer, George H. (1962), Hydrothermal Wurtzite at Thomaston Dam, Connecticut. American Mineralogist: 47(7-8): 977-979.; Segeler, Curt and Molon, Joseph. (1985), The Thomaston Dam Site, Thomaston, Connecticut; Rocks & Minerals: 60(3): 119-124.; Vogt, Wolfgang. (1991), Rediscovering Thomaston Dam. Lapidary Journal: April. [Calcite] Powell, Richard C. and Wolfgang Vogt. (1987), Cinque Quarry, A Suburban Site in Connecticut Makes Collecting a Cinch. Rock and Gem: (6): 36-39. [Calcite] Weber, Marcelle H. and Earle C. Sullivan. (1995): Connecticut Mineral Locality Index. Rocks & Minerals (Connecticut Issue): 70(6): 407.; P. Cristofono collection. [Magnesite] Ague, J. J. (1995): Deep Crustal Growth of Quartz, Kyanite and Garnet into Large-Aperature, fluid-filled fractures, northeastern Connecticut, USA. Journal of Metamorphic Geology: 13: 299-314. [Calcite] Min Rec 36:3 pp 289-290 www.gamineral.org/ft_drum-pics.html. [Calcite] Rocks & Min. : 64:203. [Rhodochrosite] King, V. and Foord, E., 1994, Mineralogy of Maine. [Calcite] U.S. Geological Survey, 2005, Mineral Resources Data System: U.S. Geological Survey, Reston, Virginia. [Rhodochrosite] Manganese at Butte, Montana; J.T. Pardee 1918; U.S. Geological Survey, 2005, Mineral Resources Data System: U.S. Geological Survey, Reston, Virginia. [Calcite] Specimens from Frank Imbriacco III pictured on Mindat. [Calcite] A Quest for New Jersey Minerals, Robert Speiser (1978):9. [Smithsonite] USGS Professional Paper 68, The Ore Deposits of New Mexico; Palache, C., Berman, H., & Frondel, C. (1951), The System of Mineralogy of James Dwight Dana and Edward Salisbury Dana, Yale University 1837-1892, Volume II: 180..; GF Loughlin (1942) Geology and ore deposits of the Magdalena mining district, New Mexico. USGS Professional Paper 200. [Calcite] Jensen, David E. (1942), Minerals of the Lockport dolomite in the vicinity of Rochester, N.Y. Rocks & Minerals: 17(6): 199-203. [Calcite] Palache, C., Berman, H., & Frondel, C. (1951), The System of Mineralogy of James Dwight Dana and Edward Salisbury Dana, Yale University 1837-1892, Volume II: 155; Mineralogical Record: 32: 273. [Calcite] Berkheiser, Jr. Samuel W. (1983), Reconnaissance Survey of Potential Carbonate Whiting Sources in Pennsylvania, Mineral Resource Report 83. [Calcite] SDSMT Bull 18 Roberts and Rapp "Mineralogy of the Black Hills"
[Siderite] Hawley, J. & A. Bevan (1934) Mineralogy and genesis of the Mayville iron ore of Wisconsin: american Mineralogist: 19 (11): 493- 514. [Calcite] Rocks & Min. : 59:68 & 64:14.; U.S. Geological Survey, 2005, Mineral Resources Data System: U.S. Geological Survey, Reston, Virginia. ; U.S. Geological Survey, 2005, Mineral Resources Data System: U.S. Geological Survey, Reston, Virginia.